The U of I Community Credit Union held a blood drive on Wednesday, September 27th at our First Street branch. 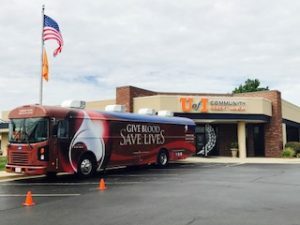 The Community Blood Services of Illinois performed the blood drive inside their Bloodmobile (pictured below). Many U of I Community Credit Union staff members participated in the event through appointments and walk-ins. We are proud to announce that we hit our collection goal two years in a row! This year, the Community Blood Services of Illinois was able to collect 10 pints of blood. This is enough to save 30 lives! . We would like to thank the Community Blood Services of Illinois and all of the blood donors for making this event a success. We are committed to our community, and this event was a great opportunity to give back.